and a crab cream croquette. Ever since I returned from Japan, I've been striving to perfect a curry recipe that lives up to CoCo Ichiban, a famous chain restaurant with locations all over the country. If you're not familiar with Japanese curry, the first thing I need to point out is that it's very different from Indian curry. The flavour was introduced to Japan by the British in the 1800s, and continued evolving to suit the Japanese palette. The standard Japanese-style curry is a thick sauce created from curry powder and usually flavoured with pork or beef, and served over short-grain Japonica rice. Onions, potatoes and carrots are often used in homemade Japanese curry, but you can add whatever you like, or keep it smooth, restaurant-style. 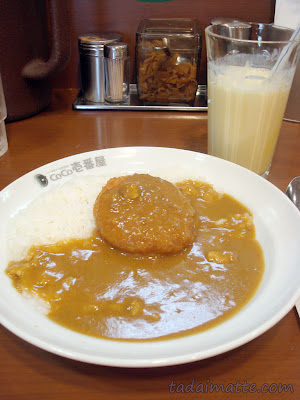 Curry rice is usually considered a comfort food, and it is so popular (especially with children) that it's offered at many restaurants and cafes. None, however, take it to the level that CoCo Ichiban does. They are a curry-only restaurant that offers scaling levels of heat and a myriad of toppings for your dish; things that you may not have ever considered adding to curry rice. Chopped tomato, spinach, asparagus, fried quail eggs...if they think it'll sell as a savoury topping, you'll find it at CoCo Ichiban. CoCo Ichiban serves a liquidy curry with a yellowish tint, and it's my understanding that the broth is pork-based. Even the lowest spice levels have a kick to them! I found that it was not as sweet as some other curries I'd tried, and I really liked that it was served so basic, without the onion-potato-carrot combination, unless requested. While I'd made and enjoyed curry before, I found myself craving CoCo Ichiban specifically - something about their curry was just fantastic. When I stayed overnight in Shibuya over winter break one year, I've find myself emerging from my capsule at 7 A.M. and starving. CoCo Ichiban for breakfast? Yes ma'am! A half-plate of cheese curry with a mango lassi to drink set me back just ¥400. Four hundred yen! Seriously! I suspect it was these early-morning curry runs that got me hook, line and sinker - usually I'm so queasy in the mornings that there are only a small handful of foods that I can safely eat. Curry is definitely the strangest. Any other toppings you like - why not check out CoCo Ichiban's bilingual menu for ideas? In a pot or frying pan, cook the bacon through, and sauté the onion, if using. Add water and bring to a boil, then remove from heat and stir in the curry sauce mix. You can use other brands of curry sauce if your selection is limited, though S&B Golden is the closest to the real thing. You can also experiment by using 1/2 a package of one brand and 1/2 a package of the other. This post on Serious Eats is a great primer! Nowadays, I almost always do a blend of Kokumaro and Golden. *Note that many stores in the U.S. and Canada carry smaller packs of curry roux - the net weight of these is in the 125 gram/4.4 oz range. In Japan, you will get two "blocks" of roux per 240-gram box. Please check your box to make sure you have the correct amount! If you want to use a large box or two small boxes of different brands, remember to double the amount of water, bacon and sugar written above. How's the consistency? CoCo's curry isn't as thick as most homemade curries tend to be. Thin it out with the reserved water if you need to. (If you've thinned it too much, add a tablespoon of corn starch dissolved in cold water.) Finally, add the brown sugar and stir it in. If you've added onions, but you still want that smooth CoCo Ichiban texture, strain out the onions with a sieve. Warm your plates in the microwave - this is really important, or the curry will cool down too fast and congeal! Then dish out the rice, top with 1/2 cup shredded cheese and 3/4 cup or so of the sauce. Sprinkle on a bit of salt, pepper and chili peppers/cayenne pepper to taste.